We make sure our range of car heaters is both specialised and extensive here at Advanced Radiators, to guarantee our customers can find exactly what they need. Whatever your requirements, our stock and workshop facilities ensure complete customer satisfaction. We understand that having to replace any car part can be a stressful and sometimes costly situation. 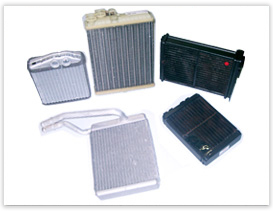 That’s why taking the stress out of replacing your car heater is an essential part of the Advanced Radiators service. In fact, we remove any hassle by helping you to identify the correct heater for your vehicle via our useful and comprehensive online catalogue. Once you have identified the correct car heater, we guarantee that we will not be beaten on price and customer service. It’s for this reason that Advanced Radiators is one of the UK's leading car heater specialists! Begin browsing our huge collection of car heaters by using our simple search function and get a two-year guarantee on all quality assured products purchased. If you’re unsure of which car heater to choose, don’t hesitate to contact our team.